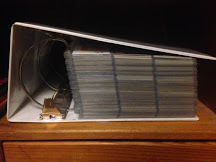 Yesterday, I posted a little bit of a rant about the revamp of Topps Total. To recap - I loved the original run of the product but this new version of Total is an overpriced, on-line exclusive, bastardization that besmirches Total's good name. In other words, I am not a fan. 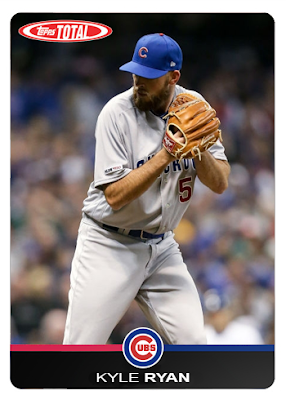 Even with my disappointment, with first 100-card wave (of nine) having been made available through Topps' website yesterday, I couldn't help but flip through and see what Cubs made the checklist. Daniel Descalso, the off-season free agent signing made to replace Tommy LaStella, was the only non-marquee North Sider to earn a bullet point, so far. No images have been released of Daniel's card, so far, as the checklist only just went live and orders haven't been shipped yet. So, I took it into my own hands to whip up an example for my "rave review" post from yesterday. The template wasn't too hard to make and I was rather happy with the finished product. At first, that made me even more mad that I wasn't going to be able to afford 2019 Total (unless I can find good deals on the secondary market). However, upon further reflection, I decided that since I had a template all ready to go, I should just take matters into my own hands and create my own version. It's all the fun of Total and it costs me exactly nothing. What a deal! Honestly, the Randy Rosario card might be my favorite of the whole bunch - I love the image that I was able to find for the lefty. These guys have both been in Chicago since last summer and were ignored by Update and all other pertinent releases. No love for middle relievers. The first two call-ups of 2019 were both covered by my mock Total. 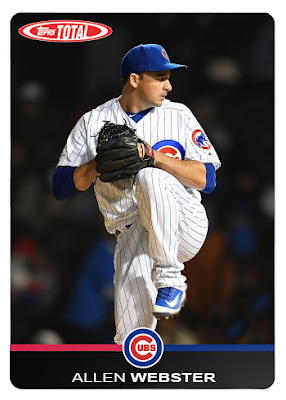 Ryan made his Cubs debut last week and Webster only had a brief cameo at the very end of last season, so it's no surprise that they have no Cubs cards in their cardboard ledger yet. Hopefully they pitch well enough to earn a real one some day. Lastly, we have another off-season, free-agent signing in Brad Brach. There are surprisingly few images of Brach in Cubbie Blue on the internet, so I had to go a little off-kilter with this photograph of him being removed from the mound. Hopefully, I can find a happier snapshot in the future and update this bad boy. 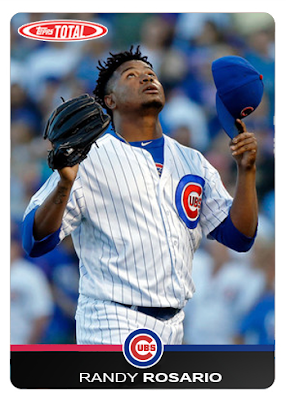 Speaking of the future, fellow off-season, free-agent reliever signings, Tony Barnette and Xavier Cedeno, will both eventually be included in this virtual checklist. 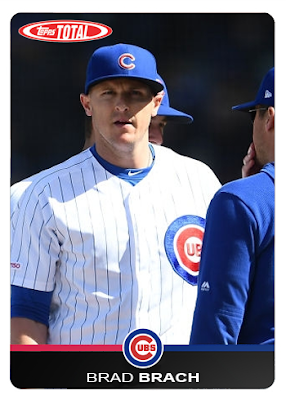 However, both are currently residing on the injured list and have been out of action for most of spring training, as well. 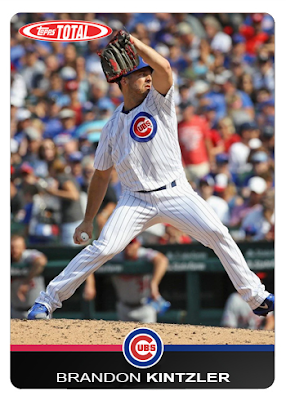 Thus, they have ever fewer usable images to choose from; so, I will be holding off on those two until they make a few appearances off of the IL and on the mound at Wrigley Field. I mean, the current iteration of Total is being released in waves; thus, it's only appropriate that so too will my copy cat version. Of course, my edition is free and not ten dollars a pack, so I still win. Look for future editions of Wrigley Roster Jenga Total at this web address. I will be making updates throughout the season as players come and go and/or when I feel like it. Also, please feel free to critique my work in the comment section below. In the meantime, I'm going to go sit and stew in my disappointment with Topps' treatment of Total for a little while longer. Well done! I think the Rosario is my favorite, too! 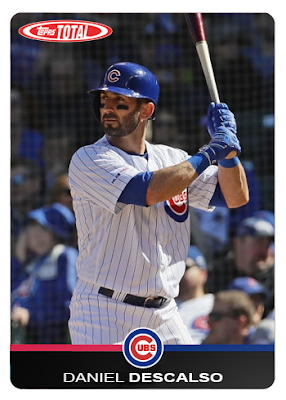 I haven't looked at the new Topps Total yet, but I really like what you've done, these are very nice. I do enjoy the look of this year's Total -- I just can't stand the price point of it and the "waves" concept.